Spring has officially arrived! Now the new season has begun it is time to sort out your wardrobe. You need to start thinking about swapping your wintry knits and coats for the fresh new spring styles. The trends this season are a mixed bag. From bright florals to minimal grey to rebellious black leather. There is something for everyone. 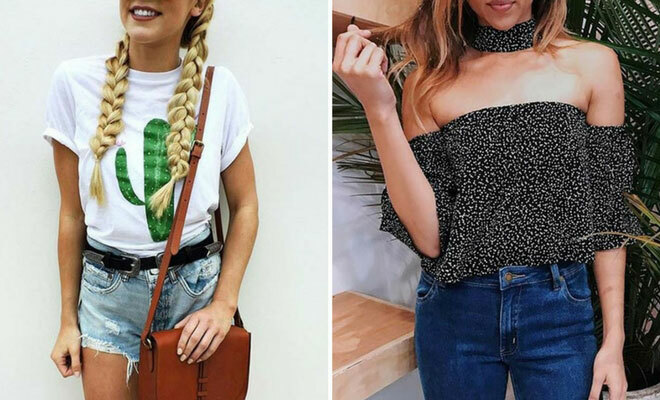 To get you inspired, we have created a list of 21 casual outfit ideas that are a must have for any spring look. Statement sleeves are one of the biggest trends of the season. 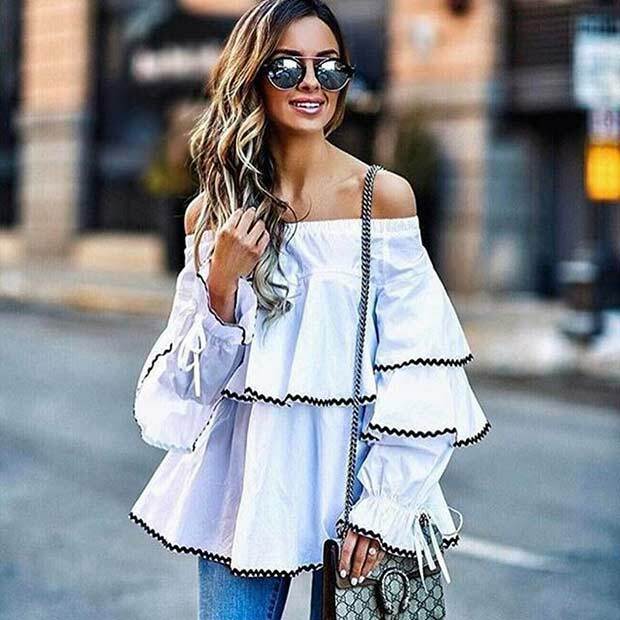 Celebrities like Kourtney Kardashian have been seen rocking a bold sleeve and now it’s your turn. You can be as adventurous as you like with this. Maybe try something printed or frilly and full of volume like this top. Pair your sleeves with a pair of jeans and it will be one trendy outfit. When the weather gets sunnier and the temperatures rise, white becomes a must have. There is something about this crisp color that makes us look and feel great during the spring and summer. When choosing white for spring choose a dress like this one. With flat shoes or sneakers, you will have a cute and casual look for any occasion. Tops with a cold shoulder feature are fashion favorites for spring and summer. 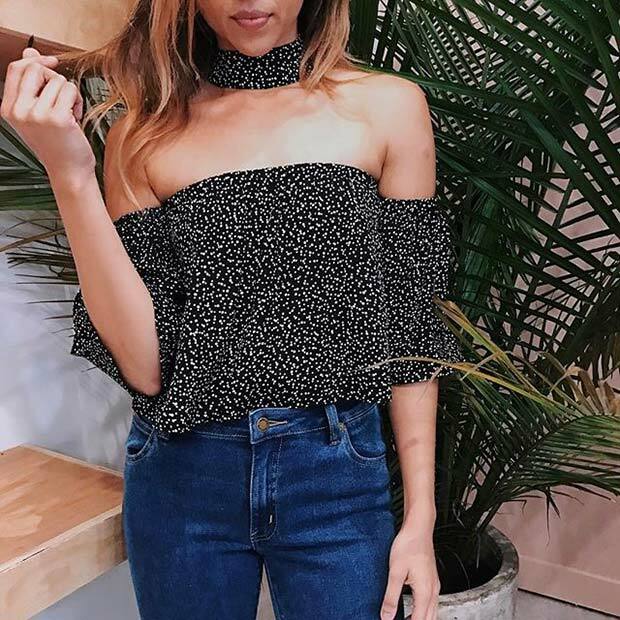 There are so many ways to wear this trend from cut out shoulders, to one shoulder styles to completely off the shoulder like this one. Pair you’re top with jeans for an easy, cute and casual look for the new season. Even though we are now in spring and the weather is getting warmer, there will be days where there is a chill in the air. Instead of reaching back for the coat why not try a cardigan. You can still wear your pretty spring tops and keep warm. It’s the perfect solution. Spring and summer are the months of fun. These seasons are for vacations and days out in the sun. Take this carefree and relaxed vibe into your fashion with a cute t-shirt like this one. You could go for something quirky like the cactus or any fun design. Wear with shorts on a warm day or with a pair of jeans for a cute and relaxed look. The 70’s have made a comeback this season. It’s all about vibrant prints, fringing and flares. For an easy spring outfit try wearing flares like these. You can wear white with anything and this outfit has a seventies vibe while keeping you looking fresh and modern. Would also work with denim blue flares. Beautiful flowers are blooming at this time of year, making floral prints a spring must have. A cute and light jacket like this features a gorgeous vibrant print that will jazz up your casual outfits. This one also has a cold shoulder feature making it a bang on trend look for spring. If you like chic minimalist outfits, then this if you. This an outfit for the chilly days. The sneakers and trousers give it a smart casual vibe while the turtle neck and jacket are super stylish. Not only does each piece create a trendy outfit but you can take each element and re work them to suit any weather and any occasion. Jeans that show a bit of ankle are great for the this season. It’s an alternative style to full length jeans and is great if it’s not warm enough for shorts. Not only that but you can show off your pretty shoes! Wear your jeans with a cute top for a spring casual look. On the days where you want to look good but don’t have a lot of time then a knitted sweater like this is what you need. It’s casual, comfy and easy to style. Wear with white jeans like these to update the sweater for spring. Would also work with light denim jeans to.